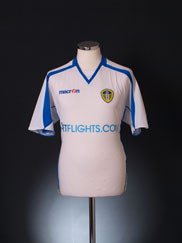 Until 1933 Leeds home kit was based on that of near neighbours, Huddersfield Town, blue and white stripes. After then their home shirts were predominately yellow and/or blue, in 1960 the white kit was introduced, a change influenced by the kit of the Spanish team, Real Madrid. LUFC>talk - LEEDS UNITED FANS FORUM http://www.lufctalk.com	Leeds United fans messageboard to discuss all things LUFC! LUFC Forum http://www.leedsunitedforum.tk	Chat Leeds United style! A forum for all LUFC fans everywhere. Join now! Gelderd End http://www.gelderdend.com	A Leeds United fans forum. Join today! Leeds United Match Worn http://www.leedsunitedmatchworn.co.uk	The purpose of this site is to share my collection of Leeds United player shirts and give you the opportunity to look at them in close detail and read about their history.